Article first published as Blu-ray Review: 'DC's Legends of Tomorrow: The Complete Second Season' on Blogcritics. New to Blu-ray, DVD, and digital is DC’s Legends of Tomorrow: The Complete Second Season. A spin-off of fellow CW series The Flash and Arrow, Legends finds a group of misfits, both heroes and villains, who are not notable to history banding together to protect all of time. The Complete Second Season is basically a continuation of the first year, but with several of the team members swapped out. A new set of villains, pulled once again from the two parent shows, helps make the adventure fresh. I loved the premise of DC’s Legends of Tomorrow from the start, and appreciated many of the characters in the ensemble, but was underwhelmed with season one. Thankfully, season two does much to correct that right away. The first year was saddled with an uninteresting story arc that weighed things down. The Complete Second Season does have an ongoing plot thread, but it travels to many more time periods, takes itself less seriously when it’s appropriate to do so, and deepens the characters, making the show into the fun romp it should have always been. Not every episode is gold, and sometimes the effects and scale of action have to be lesser than they should be for budgetary reasons. But even some of the duller ones, like “Abominations,” have exciting elements that make the most of the money, like Confederate zombies! Yes, the show plays fast and loose with the premise; plenty of things the characters do or see should change history seriously and they don’t, while minor changes have large impacts. However, the season starts and ends strong, with swashbuckling and adventure, and overall, it’s a pretty entertaining run. A big part of how much enjoyment The Complete Second Season has to offer are the antagonists. The Legion of Doom is comprised of three previously seen villains: speedster Eobard Thawne (Matt Letscher), who has a very powerful motivation in these episodes; incredibly dangerous magic master Damien Darhk (Neal McDonough); and the always charming Malcolm Meryln (John Barrowman). Even before they are joined late in the game by former Legend Captain Cold (Wentworth Miller), they have engaging chemistry that makes one gleefully anticipate every scene they’re in as a group. They set a high bar for season three to live up to. Less successful is the way the team has changed. While the Hawks were good characters to jettison, Captain Cold’s presence is missed, and too different when he returns on the other side to be comforting. Neither Nate (Nick Zano) nor Amaya (Maisie Richardson-Sellers) are that gripping. The former would have been much more interesting had he not eventually gotten powers. The season suffers from the decreased presence of Rip Hunter (Arthur Darvill), though the benefit of his absence is the welcome increased importance of Sara Lance (Caity Lotz). I’d say this mostly makes the makeup of the group a wash, though the chemistry between those around for both years has strengthened delightfully, with Mick Rory (Dominic Purcell) having an especially compelling arc in how he relates to everyone else. As far as bonus features go, I’d say this release has the minimum needed to be decent, but nothing particularly special. There are a handful of deleted scenes and a fun gag reel. The Comic-Con panel included is from 2016, so not a terrible way to get excited before watching the season, but far less valuable after you’ve seen the episodes, and since its on the last disc, that’s likely when people will view it. It would be far wiser to include the 2017 panel instead, but they did not. There’s also a featurette on the “Invasion!” crossover between all four CW DC shows, Arrow, The Flash, DC’s Legends of Tomorrow, and Supergirl. The Legends contribution to the miniseries is the finale, and the episode itself is pretty good. But the featurette itself seems to be talking about ideas that aren’t fully communicated on screen, and I found the full story to be relatively disappointing. It didn’t quite living up to what I’d hoped for, changing course too much between parts and shifting the makeup of the combined group hourly without satisfying explanation as to why. Yes, this is a mixed review, but overall, I would recommend DC’s Legends of Tomorrow: The Complete Second Season. I’d say that just for Victor Garber’s performance alone, but he’s far from the only redeeming quality. This batch was better than the first, and I’m optimistic about where the show will go from here. 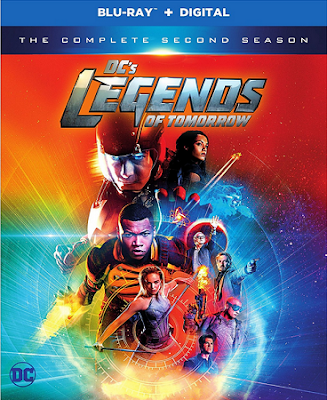 DC’s Legends of Tomorrow: The Complete Second Season is available now.